Function: Bathroom Basin Mixer Sink Tap Faucets. 1 x Waterfall Counter Top Basin Mixer Tap. Waterfall Spout Design Prevent Water Splash, Water-Saving. Hot & cold mixer mono tap. Installation Holes: Single Hole. 1 x Basin Mono Mixer Tap. Manufactured from heavy solid brass. Material: brass. Subject to a minimum pressure of 0.5bar to maximum 3bar. 1/4 turn ceramic disc technology. UK standard size fitting - ½" BSP. Water Mode: Stream,waterfall. Sub-TypeMonobloc Mixer. Modern design makes your bathroom more fashion and creates a stronger sense of belonging. Tap TypeSingle Lever. FeaturesWaterfall Tap,Complete fitting accessories. Water Mode: Stream,waterfall. Sub-TypeMonobloc Mixer. FeaturesWaterfall Tap. Tap TypeSingle Lever. Modern design makes your bathroom more fashion and creates a stronger sense of belonging. ② Don't split mixer tap by yourself. Hot & cold mixer faucet. We really appreciate your support! Smooth single lever handle, single hole design. Complete with water hoses & accessories. Easy to install and clean. 2 x Stainless steel braided hoses(about 40cm). Combination boiler systems. 1 X Basin Mixer Tap. Cell Phones & Accessories. Exceptional build quality and finish. Gravity-fed systems (only with a pump). Pumped hot water systems. Standard pressurised hot water cylinder type systems. 1 x Basin mixer tap. Diffuser fitted in spout for smooth water flow. Single lever for operation. Move lever Left/Right for Hot / Cold, Up/Down for water flow. 0.5 to 5 Bar water pressure required. Condition is Used. only used for 6 months. When the water temperaturebelow 31 ℃, the faucet turnsblue ;. 1 x LED Water Faucet(Battery Not Included). -The tap need to be installed four AA batteries and it can run for one year and just need 20 seconds to replace them. 1 x Basin Mixer Tap. Hot and cold indicators (H & C) on tap head. Shower Enclosure. Key Features. 1/4 turn ceramic disc technology. Gravity fed systems (which may require a pump). Suitable for the following water systems. The sprayer with built-in water-saving bubbler, water flows gently and won't splash out. This automatic sensor faucet is especially suitable for bathroom and public toilet. It is a mixing tap allowing you to shift warm or col water. 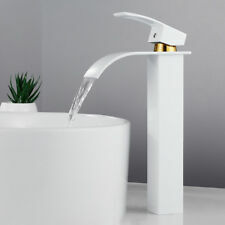 Square Waterfall Basin Mixer Tap. Basin Mono Tap Free Basin Waste. Square Waterfall Bath Mixer Tap. Free Basin Waste. Bath/shower mixers include hose, shower head & wall bracket for holding the shower head. 1 x LED RGB Bathroom Sink Mixer Tap. The faucet can light in different colors based on different temperatures All copper mounting nut base,more solid, do not shake. Is it powered on its own by flow of water. Water Mode: Waterfall. Type: Bathroom Shower Mixer tap. 1 x Bath Shower Mixer. Easy to assemble. Handle Material: Zinc Alloy. Main Body Material: Solid Brass. Kit includes fixtures, fittings and flexi hoses. Application: washstand. Rooms: Bathroom. Version: single lever fitting. Standard 1/2 "standard port make this product easy and easy to assemble. Quantity: One hole and one handle. Applicable mounting hole: ø32mm - ø35mm. This beautiful, contemporary mono basin mixer tap is made from solid brass with a. Fixing kit supplied to enable tap to be tightened to basin. of the tap by making it more resistant to corrosion; ideal in hard-water areas. Water Mode: Stream,waterfall. Sub-TypeMonobloc Mixer. Tap TypeSingle Lever. FeaturesWaterfall Tap. Modern design makes your bathroom more fashion and creates a stronger sense of belonging. ② Don't split mixer tap by yourself. 1x Faucet,2x Mixer Hoses,1x Fitting Kit. Mixer Hot and Cold water,Long Lasting & Smooth. Installation Holes: One Hole. Cold and Hot Switch: Yes. 1 x Modern Hot & Cold Water Tap Mixer Kitchen Sink Faucet Spout Spray Mixer (Silver). This item is well made of premium material for durable and practical use. The precise design allows you to use hot or cold water conveniently. Cloakroom Basin Vanity Units. Basin Mono Mixer Tap Only £17.95. Basin Mixers. Extended Basin Mixers. Mixer Shower Valves. Toilet & Basin. They are of great build quality, with a splash-free waterfall from the spout, which is great for a modern look in your bathroom. Furthermore, you must connect your water pipe work which will ensure your bath is filled from behind the overflow waste. You have the right to cancel your order at any point before the goods are dispatched. Type: Basin Mixer Tap. Is it powered on its own by flow of water. Functional categories: LED faucet ,the battery was not included. LED turns Blue between 0-30 Celsius ( 32-86 Fahrenheit ). LED turns Green between 30-40 Celsius ( 86-104 Fahrenheit ). ◆ Installation type: Basin. ◆ Very modern and fancy tap for your sink.New 2019 Design. ◆ Number of holes: One hole. ◆Solid Brass Construction & Ceramic Disc Valve: resist scratches and corrosion. ◆ This fitting can be connected to all normal hot and cold water connection systems. 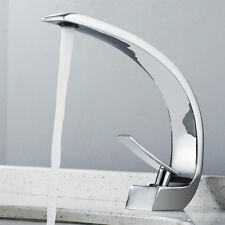 Faucet Height: 31cm. Humanization design: Faucet body and outlet appearance more adoption curve curved design, making the overall softer, not easy to scratch. Modern design: Tap body constructed of solid brass and stainless Steel to ensure durable use.